Congrats to Better Homes and Gardens Rand Realty Agents Named to HGAR’s 2019 Leadership Team! Congratulations to the new Hudson Gateway Association of Realtors (HGAR) Leadership team for 2019 – which now includes nine of BHG Rand Realty agents and managers! In particular, super kudos to Renee Zurlo, Rand Realty General Manager Greater Hudson Valley Region, who was named HGAR President for the fourth consecutive year. Renee also earned the title of HGAR’s “Realtor of the Year” for 2018. We are so excited and proud of this incredible accomplishment. The HGAR Board of the Directors now includes: Denise Friend, Westchester County Regional Manager; Lydia Hendricks, New City Career Development Manager; Maryann Tercasio, Orange County Associate Broker; Clayton Livingston, Rand Commercial Development Leader; Roberta Bangs, New City Associate Broker; Katheryn DeClerck, Goshen Associate Broker; Robert (Bob) Shandley, Rand Commercial Real Estate Salesperson; and Richard Herska, Nyack Associate Broker. These nine esteemed Rand Realty colleagues have been dedicated HGAR members for many years, are at the top of their field and have been in real estate for decades, and oversee numerous offices and agents throughout New York and New Jersey. “The opportunity to serve is an opportunity to help mold the direction of the association for its members and an industry we all care about,” said Katheryn DeClerk. “It is an honor and a pleasure to serve and I’ve always taken the stance with every decision I make that I could look into any member’s eyes and be proud of that decision.” Katheryn has been a licensed agent for 20 years. She had been a member of the Orange County Association of Realtors since 2007, and when the association merged to become HGAR, she was named HGAR’s president-elect, and then president in 2013. In addition, Katheryn is an HGAR instructor and has participated on numerous committees, including the finance committee and education council. She has also served on the Board of Directors for the New York State Association of Realtors as Regional Vice President. In 2013, Katheryn was appointed by the National Association of Realtors as a Federal Political Coordinator for the 18th District where she still serves as a liaison between realtors and Sean Patrick Maloney. Says Bob Shandley, who has been named to the HGAR Board of Directors for the second year, “Being a Director of HGAR, I have the ability to communicate on behalf of my colleagues in the real estate industry and can serve as a voice for them — discussing issues that we all feel strongly about and working to make the real estate industry run as smoothly as possible. I am also able to better inform both agents and clients of what is going on in the industry and what to expect going forward.” Bob has been a success in the real estate industry for 15 years. Five years ago, he started to get involved in various real estate organizations, including the Women’s Counsel of Realtors where he served as a communications director. 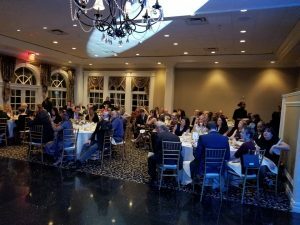 The 2019 HGAR and Hudson Gateway Multiple Listing Service (HGMLS) Board of Directors were installed into their leadership positions at the Installation Gala at Falkirk Estate and Country Club in Central Valley, New York.